Many religious travel groups are finding that the Buena Vista Suites in Orlando is a perfect home base during the area’s religious events. The hotel’s spacious rooms, first-class amenities, meeting space, recreation areas—and especially its proximity to Disney World—keep religious groups coming back. Rooms come as either standard double queen suites or deluxe king suites. Every suite includes a living room with a full-size sofa bed and a 42” flat-screen HD LCD television with high-definition cable and HBO at no extra charge. Each bedroom has a primary door to the living room and includes a 37” television. A coffee maker, microwave and mini-refrigerator are standard in each suite. Bathrooms are tiled with granite countertops and curved shower rods. 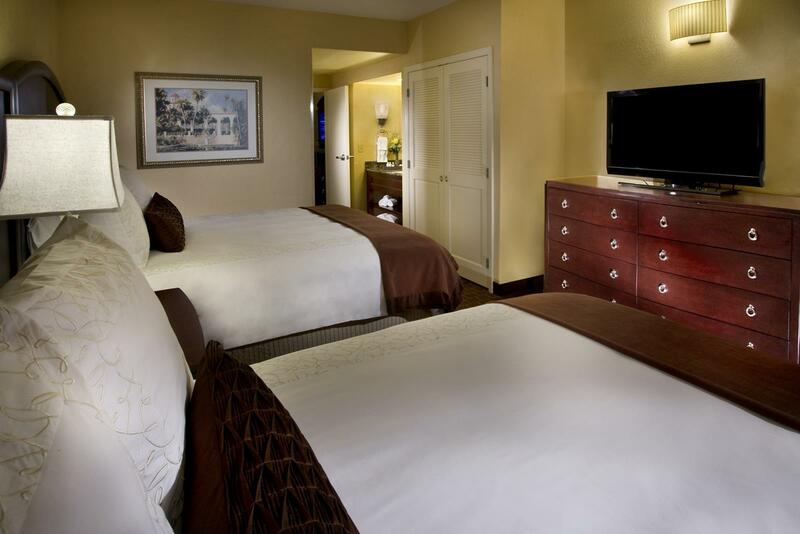 Standard double queen suites have two queen beds while king suites feature one king-size bed. There are also deluxe king suites available with larger bathrooms and whirlpool bathtubs. All suites have an in-room work desk with an executive chair and electronic safe. Wireless internet access is available for a daily fee. Room service runs 24 hours a day. A complimentary signature American breakfast buffet is available in the Valencia Room, a casual dining area that overlooks the pool. The Vista Bistro, an elegant steakhouse, is located inside the hotel and is open for lunch and dinner. Larger groups can take advantage of the hotel’s 1,720-square-foot meeting room, perfect for meetings or banquets of up to 100 people. The Valencia Room is also the ideal venue for evening receptions or private dinners. The outdoor pool and hot tub are great places to relax in the shade of Florida palm trees. 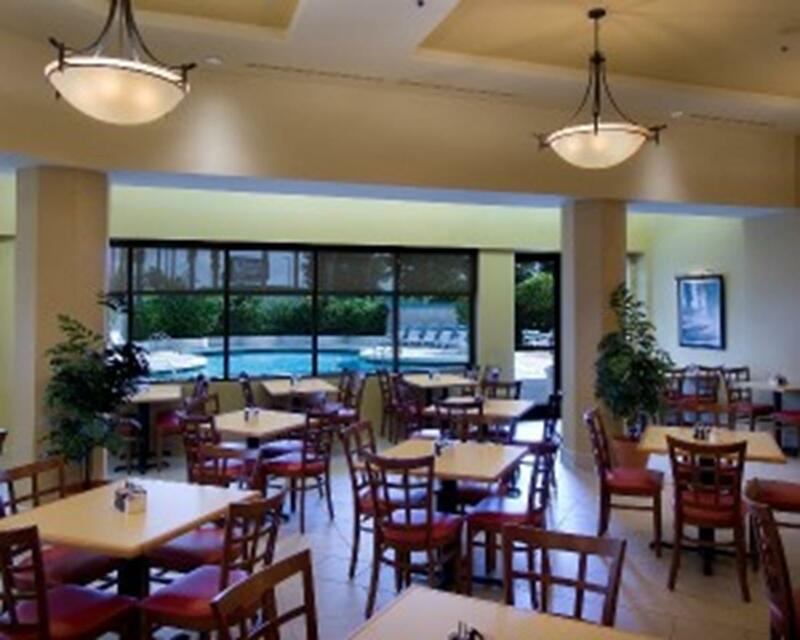 Lighted tennis and basketball courts are nearby, and equipment is available at no charge. Next door to the hotel guests can enjoy the Island Spa in its sister property, the Caribe Royale. The spa’s nail, massage and body treatments can all be charged to your Buena Vista account. Individual guests receive complimentary parking, and free shuttles run all day from the hotel to Disney World’s four theme parks, the Disney Downtown area, Lake Buena Vista Factory Stores and Orlando’s Premium Outlets. The hotel is just minutes away from Disney World and about 20 minutes from downtown Orlando. Many religious groups use Buena Vista Suites as their home base for Disney’s Night of Joy, which will take place on September 7 and 8 in the Magic Kingdom at Disney World. In its 30th year, the after-hours, two-night event will feature music superstars across a variety of genres—including rock, pop and gospel. Contemporary Christian artists like Chris Tomlin, Lecrae, Casting Crowns, Francesca Battistelli, Third Day, Kutless, Red and 2012 GMA Dove Awards “Group of the Year” NEEDTOBREATH are among the groups slated to perform. Many of the park’s popular attractions will remain open during the event, so groups can enjoy rides while they rejoice. Groups of 10 or more receive a discounted ticket price, a free event ticket for every 10 purchased and one free trip to a Disney water park or DisneyQuest Interactive Theme Park. Whatever the Orlando religious occasion, Buena Vista Suites will cater to your group. Jackson, Mississippi has a rich history from Civil War days through the Civil Rights Movement. Today Mississippi’s largest and capital city has attractions and religious sites that will draw faith-based travel groups. Branson is the unlikely location of one of the most visited cities in the Midwest. Known as the “live music show capital of the world,” Branson is a faith group hotspot for its family atmosphere, award-winning gospel shows and natural beauty of the Ozarks. Among Old Town’s treasures are five monumental churches, most of them dating from the 16th and early 17th centuries, Antwerp’s Golden Age. It’s not the dusty, sleepy biblical village you may have pictured, but the congested Israeli city of 80,000 nonetheless captivates Christian pilgrims from around the world. Cleveland, located on the southern shore of Lake Erie, is home to a variety of ecclesiastical architecture. Religious travel groups will enjoy visiting Cleveland’s attractions and restaurants as they tour the historic churches in the area. Three Must-See Shrines in the Southern U.S.
10 Top Religious Attractions in the U.S.